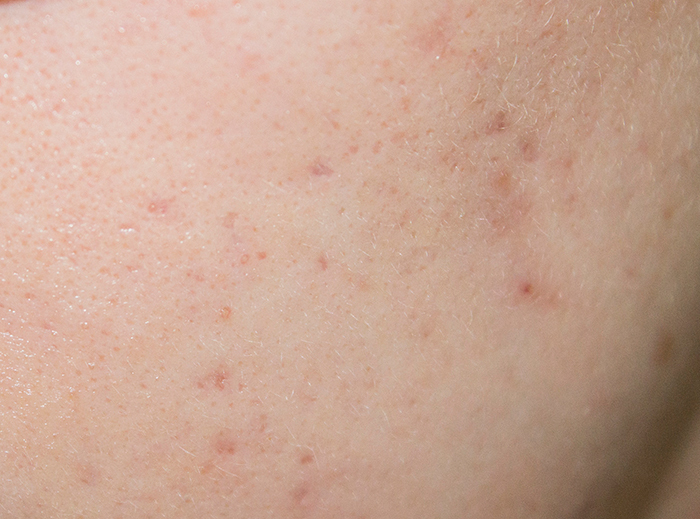 One of my main skin concerns is acne scarring. While the acne problem seems to have calmed down, it can be a bit disheartening to still have the appearance of an acne filled face, without even having a single spot. I decided to try something a little bit different and picked up a dermaroller to see if it could sort out my problems and I can honestly say, I'm overwhelmed by the results. Here's a little bit more about the roller and how to use it. First off, if you haven't heard of a dermaroller it's simply a device which contains thousands of needles which you gently roll over your face. Just from that description, it doesn't sound all that pleasant and you're probably thinking i'm crazy for even considering using one. Basically by rolling the needles across your face, it tricks your skin into thinking it's experienced trauma, therefore producing collagen to repair your skin. This not only works for acne scarring but also stretch marks, wrinkles, hair loss etc but today I'm simply just focusing on acne scarring. There's all kinds of dermarollers with varying widths and needle sizes. Pictured above and what I'm currently using is the RC 1.0mm Titanium Micro-needle Roller System Derma 1200 and while I'm happy with the 1.0mm needle size, I think a smaller width of applicator would make it much easier to get into the hard to reach areas, especially around the nose. So how do you use a dermaroller? Well first off I need to stress that this is a dangerous product and improper use can result in damaging the skin so it's important that you use it with caution. I can't stress this enough. Cleanliness is key, you should not share this product with anyone.. not even for them to try it out on the back of their hand. Before you even begin using it you need to wash it with warm soapy water then disinfect it with an alcohol spray. Any liquid soap will do, as long as it's easy to rinse off clean. 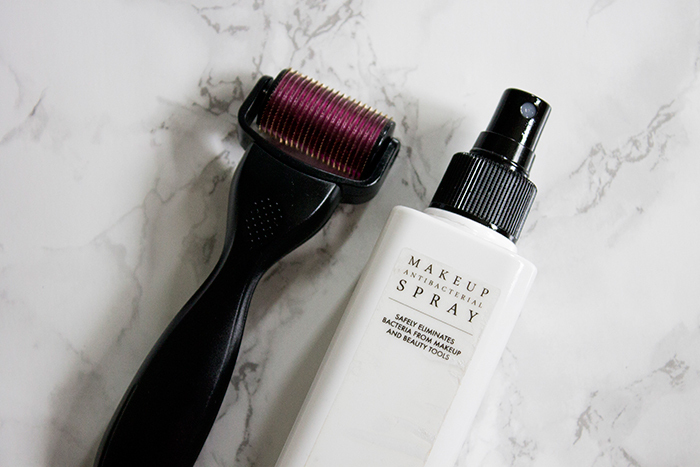 Personally I like to use my Pro Hygiene Collection Makeup Antibacterial Spray (which can also be used to disinfect your makeup!) and spray it around the needles making sure I have a clean surface to work with. If you have active acne, it's important not to use this product during that time as it can spread bacteria. If you have a single spot in one area but the rest is fine, I'd say it's ok to use it but skip the area where you have the spot. 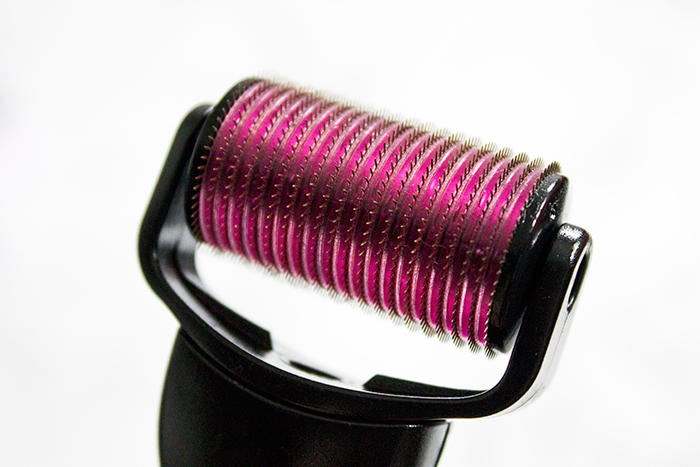 The dermaroller shouldn't be used more than once a week. Now that the tool is properly cleaned, it's ready to be used. Make sure your skin is properly cleansed and now you can begin the derma rolling process. All you need to do is gently roll it across your face, first up and down then diagonally. There are plenty of youtube videos demonstrating this technique which I'd encourage you to watch but please take the advice with a grain of salt. You should not be applying pressure when rolling it across your skin or in a fast motion. I'd personally advise to roll around 4 times in each direction. Your skin shouldn't be bright red, a little flushed at most. The question most would want to know is.. does it hurt? Well it's not the most comfortable thing in the world but it's by no means painful or unbearable. I do find the forehead the most uncomfortable as there's a lot of nerves up there but other than that, it's really not that bad. I was a little too nervous to show my full makeup free face but here we have the acne scarring on my cheek after using the dermaroller for 2 weeks. Sadly I don't have a before picture but before using the dermaroller, my scarring was much more red and angry looking, whereas here you can see my scarring appears faded but I still have a little more to go before it's completely gone. I'd be happy to post a follow up post with further results if requested. 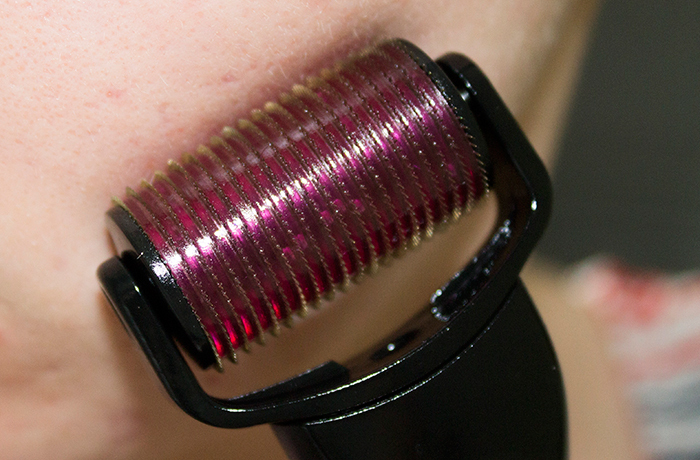 So once you've finished your dermarolling, what next? I like to give my skin around 5-10 minutes to calm down then I apply my oil/serum/cream of choice. Your skin will be more responsive to treatments after using the dermaroller so I like to make sure to add the moisture back into my skin. Sometimes I like to use moisture masks but my go to product to use is the La Roche-Posay Cicaplast Baume B5 Soothing Repairing Balm as it helps with the repairing process. I mentioned earlier that you should not use this product while your face has active acne. So while this product might not be for you, I'd recommend instead The Body Shop Facial Massager which does have the same concept but doesn't penetrate the skin like the dermaroller. It might also be a safer alternative for teens/young adults suffering from acne scarring, as I don't think the dermaroller should be used by non-adults or under adult supervision. All in all, I've been really impressed by the results by the dermaroller and I'm looking forward to the future results it gives. The process is really easy to do at home and as long as you're careful and follow all the safety steps, it really makes a difference.